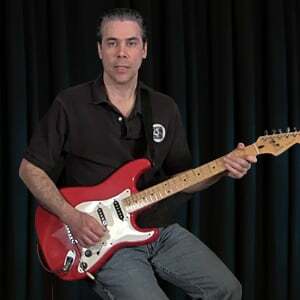 Christopher will show you some basic blues licks that form the foundation of blues soloing vocabulary This includes the following characteristics of blues lead playing: using the blues scale (minor pentatonic scale with flat 5th "blue note"), triplet swing phrasing, dynamics and articulations like sliding and bending. This is essentially a primer on playing single note melody lines in a blues style to start building a repertoire of blues licks. We'll start with one simple foundation lick then build on it. All these licks are very simple basic licks that you've heard a million times in any given blues tune. All these licks are generic enough to fit over all the changes of the blues. Each lick will be covered in detail and played along with a backing track at a slower tempo and a faster tempo.